Cozy, quaint condo w/ ocean views & easy beach access - dogs ok! 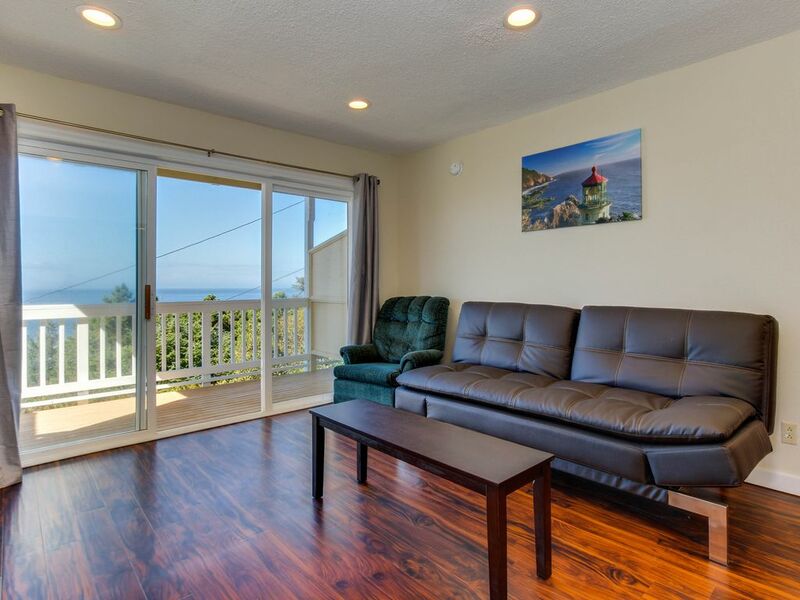 Make your next trip to the Oregon Coast affordable by staying at this condo, offering dog-friendly accommodations and exceptional ocean views for up to six guests to enjoy! Located on the first level of the Sandstone Point complex in Lincoln City, the beach is reachable about two blocks away and down a flight of stairs. There are plenty of dining and shopping options close by, as well as a movie theater within walking distance. The home has a bright feel with shiny wood floors to make you feel comfortable right away. A variety of furniture in the living area is great for relaxing in front of a gas fireplace and the flatscreen TV (cable and WiFi included). A balcony offers exceptional views of the Pacific and a fresh ocean breeze. The open kitchen is not large, but it is fully equipped to meet your cooking needs. There are even extras like a coffeemaker, blender, and dishwasher for your convenience. Pull up some extra chairs and everyone can eat together around the dining table. Two bedrooms and a futon in the living area allow up to six guests to sleep here comfortably. One room features a queen bed while the other has a set of twin bunk beds. A full shared bathroom has a tub/shower combo. A common area outside offers picnic seating and patio chairs for enjoying the sunshine, as well as a grassy area for your four-legged friends, who are definitely welcome to join in the fun (just please note a small, nightly pet fee). This condo is perfect for a small family or a group of friends - spend the day playing in the surf and the sand, or drive to nearby Devils Lake for fishing, kayaking, and more! Golfers might reserve a tee-time at Chinook Winds Casino Resort, then go horseback riding on the beach. Finish the day with a delicious seafood dinner before returning for a restful sleep back home. Your next vacation at the Oregon Coast is sure to leave everyone smiling - book today! Parking Notes: Parking at Sandstone Point is on a first come, first serve basis. Water Access: Sandstone Point is conveniently located just a short walk to the beach. Behind The Whale you will walk through the tiered courtyard to a set of well lite, comfortable stairs guiding you to a street behind Sandstone Point. Walk South on this road towards a small telephone station about a block away. From there you will find another set of community stairs that will take you right to miles of Lincoln City's beautiful beaches. This room had a good view and was clean. We would stay again. We absolutely loved our stay! Met the cleaners in the hallway and they were so nice and even let us in a little early. It was very good. Very nice view. The chears are very shaky. I would come a gin. The condo had a lovely view and was incredibly clean. It was very simple and to the point, great for a family of four for the weekend. Have your coffee on the porch and watch the waves crash!